I met Fiona at a pet store when I was 14. There were 2 other ferrets in the cage but she stuck out because she was so calm and loving. I took her home that day and We've been together for the last 7 years. Fiona was like my kid. I love her so much and we had so many good times. She never nipped and she was never very hyper like normal ferrets. She was so sweet and calm and if she climbed into my lap, I would pet her for hours till she decided to go run around and do her own thing. She had free roam of the house, which was a lot of work for me with the "corner spots". She loved to crawl up into my dresser and sleep in my clothes or bury under my bed sheets and sleep with me. She was truly one of a kind and I will never be able to replace her. I'm going to miss finding her stashes full of toothbrushes and candy. I'm going to have her cremated with her baby blanket that she loved. I love you Fiona. You will be so missed by the whole family. I hope I gave you the best life you could have had. Until later, Rest in peace. 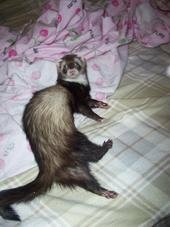 Fiona was a lucky ferret and the pain felt is just a reflection of the level of love she received and gave. All my love in this hard time, she will always be with you.